If you forget Windows user account password, especially administrator password which once lost together with user account passwords, will make you unable to logon and access to Windows desktop, you can crack the user account passwords, guess the password by brute force, reset the password via backdoor, or some other methods. Another method to solve the forgotten or lost Windows login account password problem is by using DreamPackPL which allows users to login to a password protected Windows and have full access to Windows XP or Windows 2000 without the need of a valid password or the need to change or replace the existing (old) password. The first option, Install (need administrative rights) will install DreamPack and automatically replace original sfcfiles.dll with patched version of sfcfiles.dll. After reboot, DreamPack will turn off Windows logon password check so that user can virtually access to every local account without knowing the password and modifying the password. The second option, Create CD will create a new bootable CD with DreamPackPL by using original Windows (Windows XP or Windows 2000, both will work to get access to Windows XP or Windows 2K) installation CD. The CD ISO image creation process with DremPackPL can only be done in Windows 2000/XP, and free space of at least 400-600MB is needed. After the ISO image file is created, it has to be burnt to CD by using any CD burning or writing program such as Ahead Nero. Alternatively, simply download the pre-created bootable dreampackpl_iso.zip (download link below) which pre-loaded with patched sfcfiles.dll to bypass the Windows logon security check. Extract the zip file to get the ISO image and then burn the image to a CD. Option 3 will extract SFCFILES.DLL file to selected path, which can be used to manually replace the original SFCFILES.DLL on the target system’s \Windows\System32 folder if user can boot the system using other software such as bootable DOS, BartPE, PE or XPE and the system uses FAT partition. 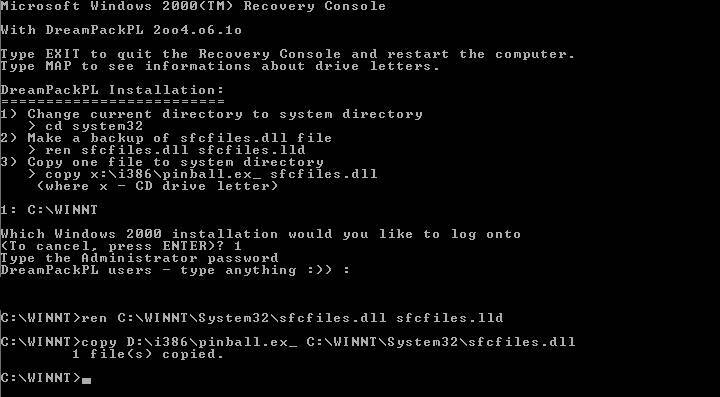 For the following hack into Windows XP and Windows 2000 machine without valid password yet not reset any password tutorial, we’ll follow option 2. Physical access to the target destination PC is a must. If you’re downloading the DreamPackPL executable, create a patched bootable ISO image. Burn or write the ISO image to CD / DVD / USB flash drive. After the boot CD disc is created, restart the PC, and boot from the CD/DVD drive or USB. 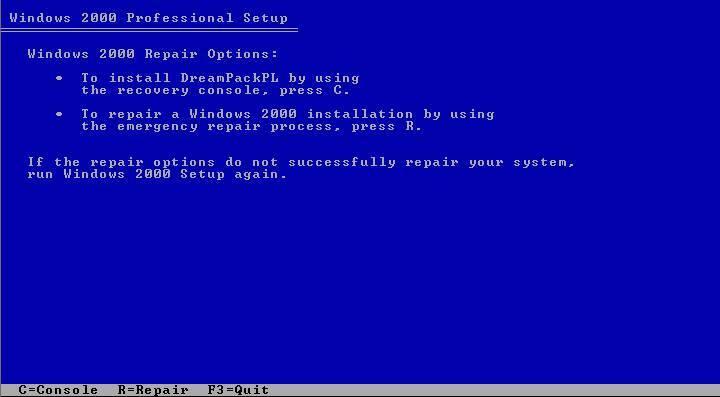 User will come to Windows 2000 (or Windows XP) Setup screen. User must load system in Recovery Console, so press R to continue and install DreamPackPL. 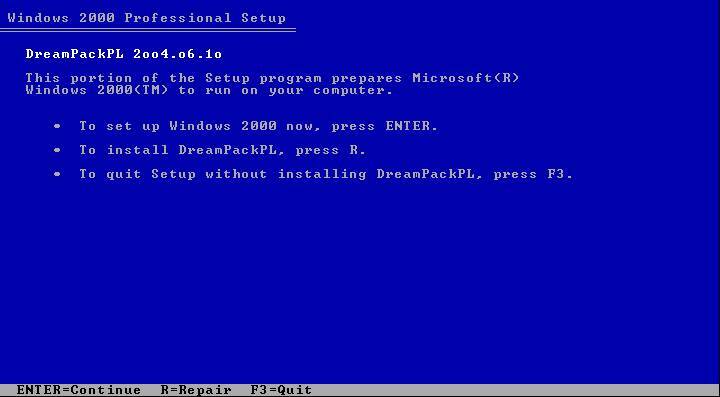 Press C to install DreamPackPL by using Recovery Console. Then select which Windows (Windows XP or Windows 2000) installation that want to log onto by keying in appropriate number (normally 1 for system with only 1 Windows installation). Key in any password when prompt for Administrator password. 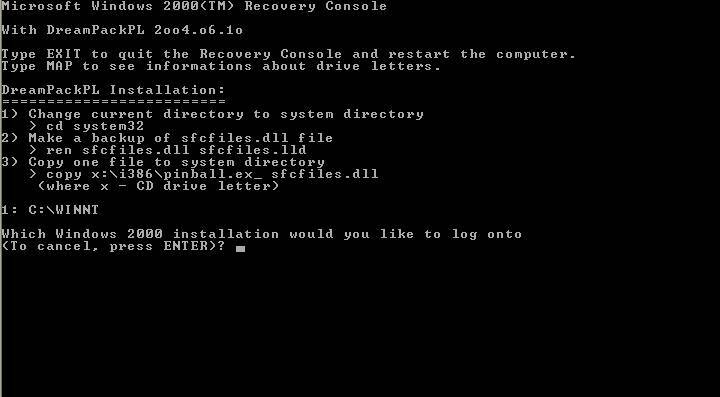 Type “Exit” and press Enter to exit from Recovery Console, and restart the PC, and let the Windows boot normally. Once Windows display Windows Logon prompt, key in “dreamon” DreamPackPL command (without quotes) in the user name or password field to display the DreamPackPL menu. Click on the top graphic on the DreamPackPL menu to display the commands options and configuration menu. Navigate to Command and click on Command Setting options. Enable the God-Password setting by selecting (check) the tick box at the end. Exit from all DreamPackPL and type “god” in the user name or password field on Windows Logon screen to log on into Windows, bypassing all users or administrator account password. Another option is to navigate to Password at DreamPackPL commands settings menu and select (check) the “Logon with wrong password and hash” option, which allows user to log-in into Windows using any administrator or user account with any correct or wrong password. Disabling Windows File Protection (always when using DreamPack). Note: You may need to disable the anti-virus protection software in order to use DreamPackPL to bypass Windows password logon security check to login into Windows system without any password modification or reset to existing accounts’ passwords, nor leave any trace of logging on. DreamPackPL can be easily uninstall by choosing Uninstall from commands menu, and the original sfcfiles.dll will be automatically recovered from sfcfiles.lld backup file.